The past few weeks have been hard ones for Australians, not least for Australian Muslims. Various alleged plots by Islamic State supporters to slaughter Australians has Islam in the news. Even as I write, five out of ten of the "most popular" articles on The Australian's website are about Islamic jihad and national security. What are ordinary Australians to make of conspiracy theories aired by Muslims on the ABC's Q&A program, implying that recent police raids were staged as a cynical act to manipulate public opinion? Are Muslims being unfairly victimised by all these security measures? How are we to evaluate Senator Jacqui Lambie's claim that sharia law "obviously involves terrorism"? Or the Prime Minister's decision to mobilise Australian troops against the Islamic State? What about the Islamic State's grandiose claim that "We will conquer your Rome, break your crosses, and enslave your women." Or [Prime Minister Tony] Abbott's declaration that the balance between freedom and security needs to be adjusted in favour of greater security and less freedom? Earlier this month, an 18-year-old Melbourne man, Numan Haider, was shot dead by police after he stabbed two officers outside a suburban police station. At the time of writing, news was breaking that authorities believed he intended to behead a police officer and post the photos online. Prison officers in Goulburn jail have struggled to contain the worst riot in ten years, during which rampaging prisoners were heard to be crying "Allahu Akbar." A Christian woman who works in a church close by an Islamic centre has asked her employer to install security measures to protect her and others at the church. Someone else, a convert from Islam to Christianity, reports that his personal sense of being under threat has risen, because he feels that people he knew from his earlier life as a radical Muslim are more likely to be activated to violence after the successes of the Islamic State and their global call to arms. Are such responses reasonable? Or are they Islamophobic? Many young Muslims have been using the hashtag #NotInMyName on social media. Many are insisting that IS does not speak for them: as Anne Aly put it, "This isn't in my name, this isn't what Islam is about, I am against it and they don't have my allegiance, they don't have my support." How then can we know the truth about Islam? A truly Christian response to the multi-faceted challenge of "Muslims behaving badly" must embrace both truth and love in equal measure. What is a Christian response to all this? How can we find our way through these crises: does protecting national security mean we risk losing some part of our soul? Truth will acknowledge that the Islamic State ideologues do claim to speak for Islam, and that they justify their actions from the Koran and Muhammad's example. Truth will acknowledge that IS has recruited tens of thousands of Muslims to fight for their cause, but apparently not a single Christian, Jew or Buddhist. As Brother Rachid, a Moroccan convert to Christianity put it in a widely distributed letter to President Obama "ISIL's 10,000 members are all Muslims. None of them are from any other religion. They come from different countries and have one common denominator: Islam." Truth will recognise that the self-declared "caliph" of the Islamic State, Abu Bakr Al-Baghdadi has a PhD in Islamic studies: he is not ignorant of Islam. It will also acknowledge that the very idea of a caliphate – a supra-national Islamic state – is a religious ideal widely shared by many Muslims. However this ideal bodes ill for any non-Muslims who fall under its power. Truth will accept that there is a price to pay for increased security. Since 9/11 we wait in queues at airports because of the actions of jihadis. As the level of threat increases, it is inevitable that our need for increased security measures will only grow. Truth will also acknowledge that many Muslims vehemently reject the methods and goals of the Islamic state, and that the #NotInMyName hashtag campaign is genuine and heartfelt. But this begs the question: "What is the real Islam?" Love on the other hand, will reject stereotyping Muslims or denigrating them with labels of hatred and suspicion. Love will reach out a hand of friendship. It will show grace instead of fear, kindness instead of rejection or indifference. Love demands that we emphatically reject speech which dehumanises Muslims or pins labels on them. It will honour those Muslims who reject the Islamic State's ideology. Love will find new friends even on the blackest of days. 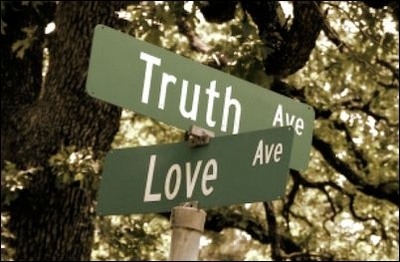 It can be tempting at times such as this to chose between love and truth. Love without truth can be gullible, opening the door to many threats. I am reminded of a Persian fable. A Fox met a Heron and said "My, what lovely feathers you have, dear Heron. May I have one?" The Heron obliged. The next day they met again. Day after day the Fox's question was repeated, and day after the day the Heron's response was the same. One day they met for the last time. The Heron had been plucked bare, so the Fox said "Heron, you look delicious. Now I will eat you. And he did." Love without boundaries, at the cost of truth, can wreak incredible havoc on innocent lives. In the end, such love is false, and will prove profoundly unloving. Genuine love does not fear the truth. True love will not deny or obscure the damaging effect of sharia law upon Christians living in Islamic societies, or the atrocities being perpetrated in the name of Islam against Christians and others by the "caliphate". It will be mindful of the words in Proverbs 24:11-12: "Rescue those being led away to death; hold back those staggering towards slaughter. If you say 'But we knew nothing about this,' does not he who weighs the heart perceive it." On the other hand, truth without love can become merciless, excluding and cruel. Love counts the cost of aggressive argument and rejects rhetoric. It takes pains to understand the other; it seeks to see the world through another's eyes and to hear words through another's ears. Love nurtures life-giving relationships. It reaches out to enmity and answers it with grace. It does not jump to conclusions, but is patient and careful. It delights to partner with and nurture truth and does not fear it. Professor Peter Leahy, former Army Chief and leading defence strategist has warned Australians that we face a war that is "likely to last for the rest of the century". If he is right, then the troubles we are facing now as a nation are only the beginning, and dealing with the potential horrors ahead will stretch our humanity to its limits. As Christians we are called to be salt and light in the world. If this means anything, it means staying true to Jesus' two great statements "the truth shall set you free" and "love your enemies, and do good to those who hate you". This is no time for circling the wagons and cowering behind them in fear. This is a time for Australians to reach out to our Muslim neighbours, to show and receive grace. In the present difficulties many Muslims will agree with Melbourne lawyer Shabnum Cassim who stated that "the everyday Muslim just wants to get on with their day." As a nation the fact that we need to respond realistically to genuine threats to our peace, and seek a true understanding of the religious beliefs that generate these threats, should not deflect us from the everyday task of getting on with our lives together, graciously, inclusively and generously.